Yesterday I had a chance to test my determination to avoid a QSO skunk and to eat at least one third of two bags of potato chips I purchased for a special outing with an icon and a titan in QRP (low power) outdoor radio. I was headed to the trailhead of the paths that lead to the top Mt. Kearsarge in Winslow State Park in central New Hampshire. Joining me on the outing were Jim Cluett – W1PID and Dave Benson – K1SWL. Jim is regarded by many on the East Coast as one of the titans of outdoor low-powered radio. Dave is an icon in QRP radio as he’s the founder of Small Wonders Lab from which the infamous Rockmite QRP radio was borne. With abnormal high temperatures over the past week, the devil black flies were swarming like Christmas shoppers on Thanksgiving afternoon. We were about to find out who would win the battle as a less-determined operator would skitter from the stunning overlook skunked with no contacts or QSOs. The other problem I faced was making sure all the sour cream and onion and barbecue potato chips didn’t disappear down the gullet of W1PID. He eats those flavored wafers faster than a tree chipper gobbles up limbs from cut trees. He almost always reciprocates with copious amounts of ice cream, so it’s a very fair exchange. The day started cool with the temperatures in the upper 50’s F, but soon the sun peppered us with a strong combination of ultraviolet and infrared rays. 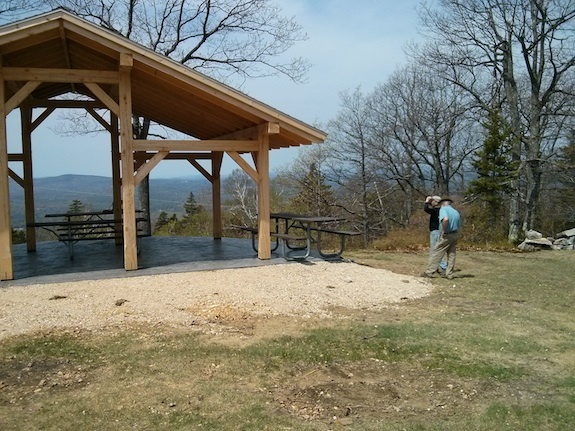 That solar heating of the ground generated a much-needed breeze at the overlook providing a natural fan helping to blow many, but not all, of the biting black flies away. Just north of the parking lot at the end of the road in Winslow State Park is a flat area with a new covered post and beam shelter. In the grass there were fire pits created by giant slabs of native granite honed by the continental glaciers that cut their way from the North Pole down to Cape Cod just 15,000 years ago. Seven or so nice picnic tables in the grass provided excellent places to set up our equipment. Thirty and forty-foot trees were on the edges of the grassy area whose many branches would provide ample support for our thin wire antennas. I was dying to test a new resonant 30-meter dipole antenna I had made the previous weekend. With a little effort I was able to get it up about 30 feet in the air with the RG-174 coax cable dropping straight down onto a picnic table. 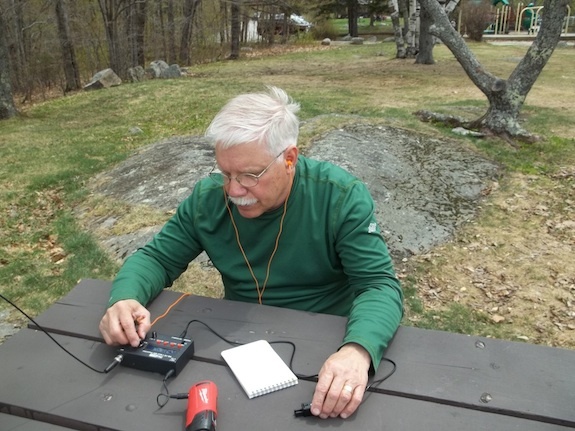 Jim used his Elecraft KX3 to determine the SWR. He said it was nearly perfect. Midday 30 meters can be a pretty dead band. I did hear one or two very strong stations, but they were involved in extended conversations and I couldn’t break in. Dave and Jim set up at different tables with Jim taking the best spot under the handsome post and beam shelter with a commanding view to the west. Just a few miles away, Mt. Sunapee had a few dangling white ribbons of snow left on her many ski runs. Soon the air was filled with dits and dahs from their matching KX3 radios. I intend to buy one as a reward for myself once I master Morse code at 18 or more words per minute. I was using my trusty HB-1B quad-band radio. It’s a workhorse of an outdoor portable radio and it makes for a great beginner radio for anyone wanting to do QRP radio. If you’re thinking of buying one, I suggest you wait. The manufacturer is introducing a new model with five HF bands that tend to be more active in daylight hours. Jim and Dave are highly skilled Morse operators. They both have been hearing code for no less than 50 years apiece. I’ve only been a serious student of CW for a little over one year and have finally achieved a moderate level of skill. I can hear Morse sent with correct character spacing at about 12 WPM. It was a Saturday and multiple contests were in progress. This made it as easy for Dave and Jim to make fast contacts as it was for the black flies to bite me on my legs, arms and the bald spots of my head. I believe Jim got about a dozen contacts in less than 30 minutes and Dave had to have about ten. I spent half my time trying to work the desolate 30 meters, and was fast approaching a skunk. “Take down that dipole and put up your par EndFedz antenna as a horizontal using the same halyards,” said Jim. “But you’ve always told me a vertical orientation was the best,” I replied more than slightly confused. Dave was hovering taking in the back and forth banter. The gears in my head were meshing. DUH! Of course the par EndFedz would work as a horizontal. I was lucky that in just minutes I could get it up about 30 feet off the ground employing the same multicord halyards that were stretching the 30-meter dipole taut. The par EndFedz is a pre-tuned antenna good for 10, 20 and 40 meters supporting up to 25 watts of transmit power. As soon as I connected it to my HB-1B I was in the center of the jungle. There were strong signals and QSOs happening everywhere on the 20-meter band. Within twenty minutes I had three Qs! NEVER before had I gotten three QSOs on an outing. It was a new first for me. Most of that was due to it being a contesting day as there were just more operators to choose from. I don’t attribute much to my poor skills. As we packed up to leave, I noticed that 95% of the potato chips were gone. I don’t think that Dave and I ate 66 percent of them, but it didn’t matter. 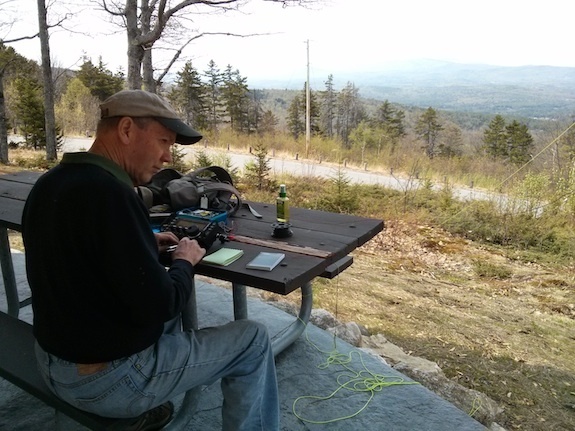 I was basking in the glory of my three contacts and being in the company of two of the top QRP radio operators in New England. Not even the devil black flies could ruin my day, even though they gave it their best shot. I hope I’m blessed to do more outings with Dave and Jim. It’s humbling to be in their company. Next time I’ll get three bags of chips. In early April of 2015 I discovered I needed to go back to Antigua to testify in a court case as an expert witness. I’ve done expert witness work for years in residential construction cases, but this was my first international foray. I had visited the gorgeous island three years earlier to do the required inspection of the defective workmanship, but I was not skilled at that time in QRP HF radio and I had zero Morse Code skills. Fast forward to this year and all that had changed. I’m now in love with outdoor QRP (less than 5 watts power) radio and my Morse code – CW is the parlance used by operators – skills are greatly improved. I’m by no means an expert, but I can hear code sent accurately with the proper spacing at about 13 words per minute (WPM). My trip this time required that I’d be on the island for a full week with lots of time to kill. I had read stories about how having an antenna next to salt water enhances its capabilities so I was dying to try it. The small hut where I’d be staying is only 30 feet from the ocean so it would be a rare lifetime experience to help a weak QRP signal get a boost from a body of salt water. I had operated a small handheld radio five years earlier in western Canada on a road trip trying to get into a repeater with no success. My research showed at that time that there was no need for me to get a Canadian radio license. I could just use my USA-issued license followed by a few letters indicating I was a USA ham operating in Canada. I thought this was all I had to do in Antigua. 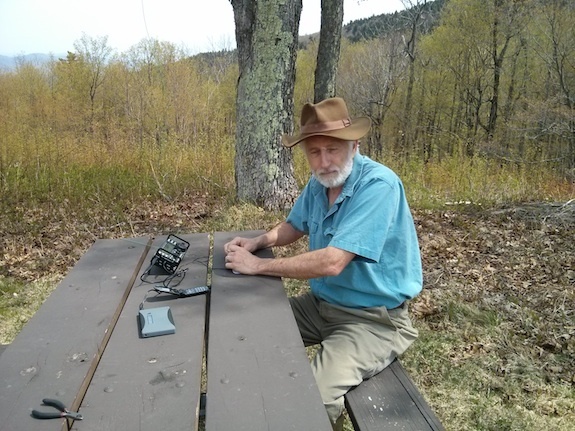 I was wrong as my QRP mentor and outdoor radio mentor, Jim Cluett – W1PID, informed me. 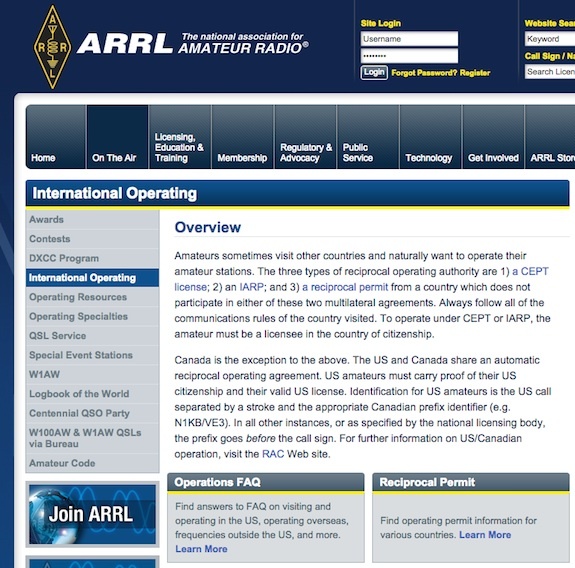 My first stop in the process was a visit to the ARRL website. There they have an entire section on International License requirements and agreements. There’s a gold mine of information there, including facts about frequencies in other nations you’re allowed to operate on! After reading much of that material, I discovered I needed a new separate license from Antigua. 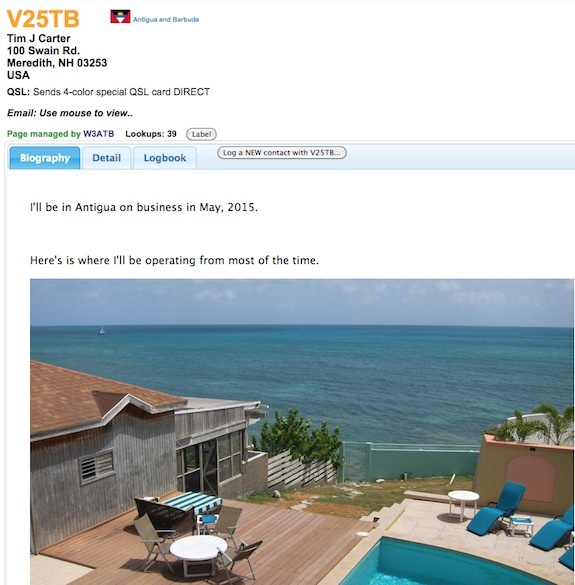 A quick search turned up their webpage that dealt with Antiguan radio licenses, but for some reason the link to Amateur was broken and still is at the time I wrote this. The Teresia he was referring to is my host in Antigua. She and her husband hired me to come to Antigua and she went to Mr. Henry’s office to complete the transaction and get the hard copy of my license. This cut weeks off the normal process of me sending money to them in the mail and them mailing me my license. The first step was to fill out a simple application form. I had to make a copy of my first two pages of my US passport and one of my FCC amateur license to show that I’m in good standing with the USA. The officials in Antigua also wanted to verify my USA license privileges. I now notice, reading the new application, that they also want copies of the technical specifications of the radio equipment you intend to use. The cost, in April 2015, for a one-year amateur license was $30 US Dollars. It only took about a week to get the license once I submitted the application and all the items they asked for. If you live outside of Antigua, you can do everything via normal postal mail, but my guess is that would add about a month to the process. How lucky I was to have my friend Teresia do the legwork for me down there to ensure I had my license before my visit. You can request a vanity call sign, I did, but someone already had: V2ATB. The country prefix for Antigua call signs is V2. Mr. Henry issued me V25TB instead. With a simple request to the folks at QRZ.com, they allowed me to register it there and manage it out of my W3ATB account. I listed my US home address for the license since I don’t have a permanent Antiguan address. The hut or house you see in the photo is where I’ll be staying. Let’s hope all they say about salt water and antennas is true! Wish me luck. I’ll be on 20, 30 and 40 meters with my HB-1B.